Her first solo show mixes collage and paint-by-number works. No one who knows Nancy Guppy would consider her career a paint-by-numbers affair. Which may explain Guppy’s penchant for taking old paint-by-numbers pictures and augmenting them with spirited — and certainly curious — collage. On May 3, 25 of Guppy’s collages will make their public debut in a solo show titled The Further Adventures of Snippity Snap at Solo Bar & Eatery in Lower Queen Anne. The seven-week exhibition includes an opening-night reception on May 3 as well as an “invitational” on May 12 — World Collage Day — featuring five to 10 artists Guppy will ask to create new paint-by-numbers pieces she can use as future “canvases” for her collage art. Her earlier work, Guppy says, tended to go heavier on the collage. More recent ones feature less collage, allowing the original painted-by-numbers images to shine through. Guppy admits to a somewhat obsessive tendency toward clipping pictures out of magazines, newspapers and catalogs, and filing them away for future use. Seattle magazine arts writer Gavin Borchert says it’s easy to see Guppy’s ready wit in her work. 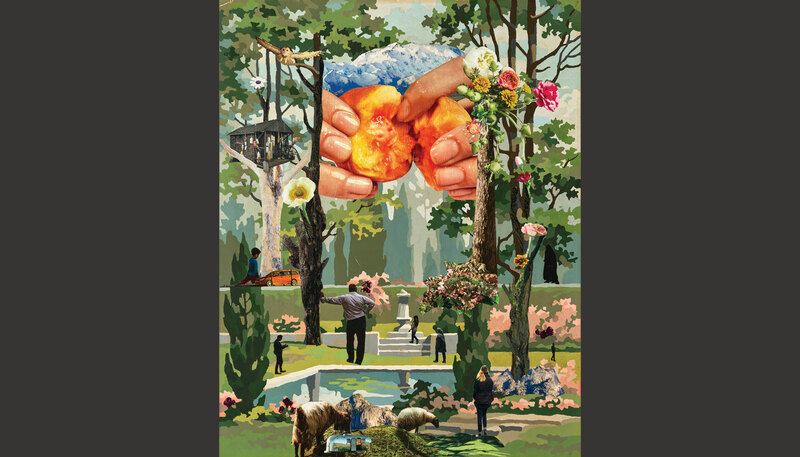 “Her piece ‘Somewhere Over There’ adds to a bland garden scene … a tiny Airstream trailer, random sheep and a dominating close-up photo of pink, juice-slick fingers … erotically pulling apart a peach,” Borchert writes in the May issue of Seattle. Guppy, however, deflects attempts to discern meaning or intent in her work. “I just keep gluing until it feels right,” she says.